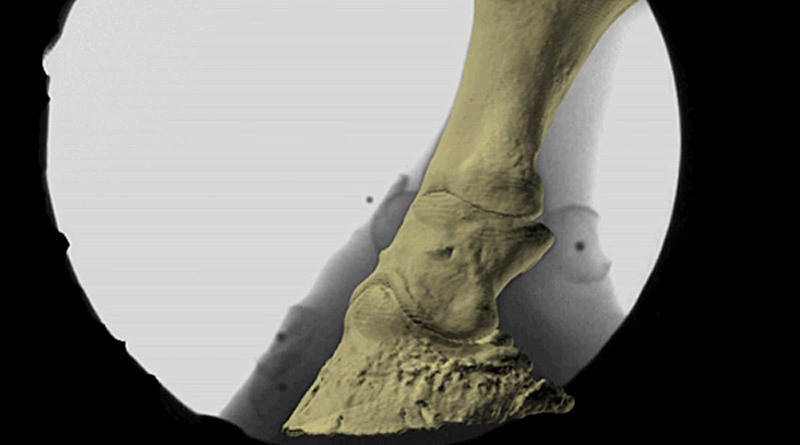 Researchers used pioneering techniques to analyse skeletal stresses in the equine foot. How do shoes affect foot skeleton stresses in racehorses? An international research team is tackling the question in a project that is likely to benefit the racing industry and protect horses from injury. Horse hooves have the ability to naturally deform during locomotion and dissipate locomotor stresses, yet farriery approaches are used to increase performance and protect hooves from wear, the study team, writing in the journal PeerJ, noted. Musculoskeletal injury is one of the main animal welfare concerns in the racing industry, notes University of Queensland School of Biomedical Sciences research team leader Dr Olga Panagiotopoulou. The researchers from the University of Queensland, the Royal Veterinary College in Britain, and Brown University in the United States are using a new approach that combines three-dimensional x-ray imaging technology with computer simulations and models to show the forces exerted on bones. “This novel combination has enabled us to study the effect of a stainless steel horseshoe on skeletal stresses within the forefoot in a live racehorse,”” she explains. “This is the first time this combination of techniques has been used in large live animals such as horses. The method was used successfully in a preliminary case study at the Royal Veterinary College in London. Royal Veterinary College vertebrate biomechanics and evolutionary anatomy researcher Professor John Hutchinson says further research is necessary. The research involved walking a thoroughbred between three-dimensional x-ray machines, an imaging technique developed by Professor Stephen Gatesy and colleagues at Brown University and used previously to view bone interaction in small animals such as fish and birds. Images of the experimental and virtual set-up. A shows the experimental set-up of the horse walking on a custom-made platform retrofitted with a forceplate and surrounded by the bi-planar fluoroscopy system. B shows the virtual setup of the horse right forefoot based on the experimental alignment of the X-ray sources and the intensifiers. Images in black frames (right and left) illustrate the projections of the distal foot from the two X-ray cameras. Panagiotopoulou used film industry animation techniques to transform the radiographic data into a life-size three-dimensional model. “By combining the 3D model with other research data we were able to measure the force the horse’s foot bones generated when they hit the ground and develop comprehensive simulations,” she says. Their preliminary findings pointed to increases in some stresses on the forefoot phalanges in the shod condition at mid-stance, consistent with the tentative conclusion that a steel shoe might increase mechanical loading. “However, because of our limited sample size none of these apparent differences have been tested for statistical significance,” the study team wrote in their paper. They anticipated that their preliminary analysis and new approach would pave the way for new directions in research on the form/function relationship of the equine foot, with the ultimate goal to minimise foot injuries and improve animal health and welfare. The research techniques shown in this video allowed researchers to zoom into the skin and hoof and measure the motion of the horse’s foot skeleton, which is not possible by other methods. have you tried these studies without the horse wearing the shoes you will find there is less stress on the legs the frog and hoof wall take up all the stress and when shoes are on their feet the legs take the stress so therefore more injuries. The frog is like a heart and when shoes are worn then the blood cant pump back up the leg. Why don’t you people experiment without shoes and see what the results will be. Its not rocket science.